[German]Some users are receiving error 0x80070057 during distinct Windows 10 operations (backup, system restore, upgrades). Recently I stumbled upon Cloudfogger as a root cause for this error code. Here are a background information about this case. Users of Windows 10 are facing many errors caused by outdated software. The source of this problem is “Windows as a service” – the operating system will be upgraded two or three times a year. In best case, a software refuse to run (this was the case with StarMoney 9 in Windows 10 Version 1607). In worst case, a feature upgrade stalls with an error or is refused due to an non compatible app. Sometimes setup.exe provided in install media (created via Media Creation Tool) warns and recommends to uninstall app xyz. But in some cases the message is pretty cryptically – as show below. We have a recommendation to uninstall an app, but the app isn’t named. I have covered this case within my blog post Windows 10 Anniversary Update: inkompatible Apps (VPC), and I discussed, how to identify the app manually. In a really bad case, the setup wizard doesn’t drop a warning, and a feature upgrade or an update installation stalls with error 0x80070057 (E_INVALIDARG, or ERROR_INVALID_PARAMETER). The error message doesn’t deliver a clue what went wrong. Some third party system tools are installing filter drivers within Windows, that are hooking system calls. Those filter drivers are passing parameters to the next sibling within the filter driver chain. I interpret error code 0x80070057 (ERROR_INVALID_PARAMETER) in a manner, that a filter driver is hooked into file system calls. And the filter driver handler doesn’t passes the parameters in a right manner to the next filter driver. Then an upgrade install, or accessing volume shadow copies (VSS) during system restore or backup fails with error code 0x80070057 (ERROR_INVALID_PARAMETER). We can check the log files written during an upgrade installation (I’ve discussed this within my German blog post Windows 10: Protokolldateien bei Upgrade-Fehlern analysieren, a few hints are also discussed here Windows 10: Analyze upgrade errors). But it’s difficult. Therefore I suggest within my blog post, to uninstall tools like third party antivirus software, system tools, TuneUp etc. and roll back all settings mode within those tools. Also you should clean the system from registry entries and files left from these tools after uninstalling them. Since (nearly) everybody has been lured into the cloud, also personal data are stored online. But there is no control, where private data are stored within the cloud. To protect private data, some people are encrypting them, before uploading them to the cloud. One popular tool available for cloud data encryption was Cloudfogger – but the project has been cancelled. The successor is www.boxcryptor.com. The Cloudfogger client was useable in Windows 10 RTM, but during the next feature upgrade (Windows as a service is greeting) users are facing problems. Error 0x80070057 has become a personal obsession to me, because I was facing this error within many MS Answers forum posts. Error diagnose for this error has been always a kind of “searching a needle within a hay stack”. Error 0x80070057 has been hit users during upgrade to Anniversary Update many times (but this error isn’t restricted to Windows 10 Version 1607). 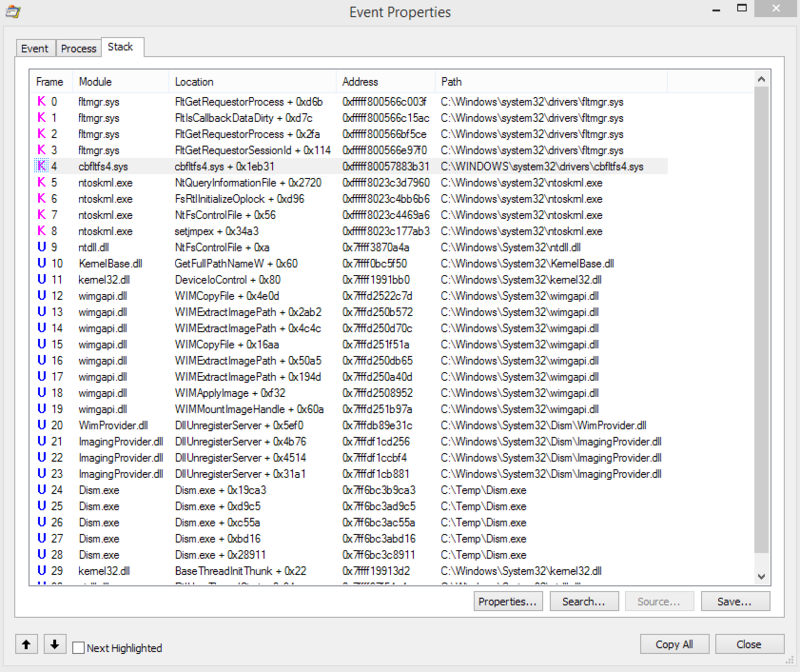 I’ve discussed several root causes within my blog post Windows 10: Update error 0x80070057. In many cases it ends with a clean install of Windows 10 using an install media (created with Media Creation Tool). My German blog post about error 0x80070057 received many hits and one blog reader left a comment, claiming Cloudfogger as a show stopper. Also another user confirmed Cloudfogger and it’s filter driver cbfltfs4.sys as a root cause for error 0x80070057. The successor Boxcryptor doesn’t have this problem – a developer left a comment, that Boxcryptor’s filter driver is compatible with Windows 10. During writing the German blog post about error 0x80070057, I found this this Microsoft Answers forum thread. User pcguru3482 reported in November 2015, that encryption tool Cloudfogger was responsible for this error. 2016-08-03 13:38:44, Error                 MOUPG  MoSetupPlatform: ExecuteCurrentOperations reported failure! Installing Windows 10 Anniversary upgrade failed, because the WIM file containing the install image could not be mounted. Also within this superuser.com post somebody complained, that upgrading from Windows 8.1 to Windows 10 Pro stalls at 23%. Analyzing setuperr.log shows that mounting the WIM file failed with error 0x80070057. The user, hit by this error, fired up Sysinternals Process Monitor and monitored the WIM mount process. The stack dump (see screenshot above) shows, that filter driver cbfltfs4.sys is involved. With this knowledge it’s easy to check a system for third party filter drivers as a possible root cause for install errors. Filter driver cbfltfs4 is on this list – searching the Internet reveals, that this driver belongs to CloudFogger. FileCrypt is the „Windows sandboxing and encryption filter“ from Windows 10 (see). I outlined the background information within this blog post. Maybe it helps to detect the root cause, if you are facing error 0x80070057 in future. This entry was posted in Cloud, issue, Update, Windows and tagged error 0x80070057, Windows 10. Bookmark the permalink.